Two candidates for FIDE President have been criss-crossing the continent of Africa vying for critical votes in a continent that is often fractured and does not always vote as a bloc. Seems like a common ritual every four years when the election campaign heats up. 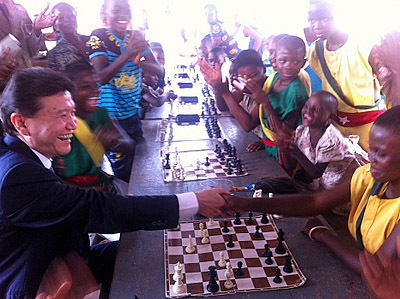 The current FIDE President Kirsan Ilyumzhinov took a tour of African countries with the help of FIDE Vice President Lewis Ncube of Zambia. While it appears that he is visiting under the office of FIDE President, his visit had a definite campaign ring. 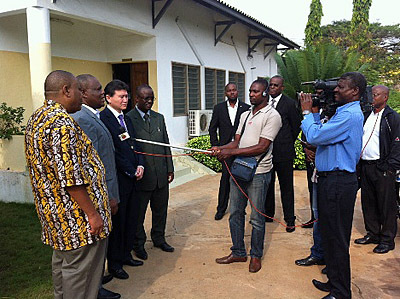 Ilyumzhinov visited Togo and Cameroon, two African nations with fledgling federations. 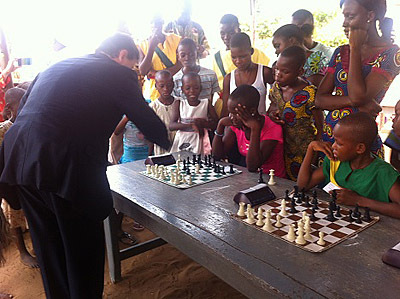 Chess is picking up momentum in the land of Togo. Last year, the Togo Chess Association held training activities with Egyptian National Master, Omar Salama. Last week, Togolese Chess President Frederic Mawuvi Koue Kouevi along with representatives from Ghana, Mali, Ivory Coast, Senegal received Mr. Ilyumzhinov. 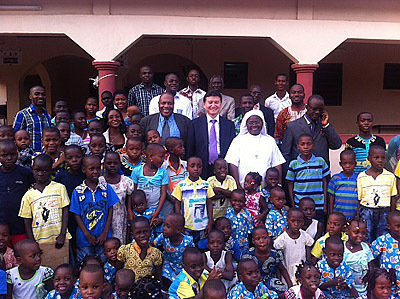 In Togo, there were site visits to schools including an orphanage 50 kilometers outside of the capitol, Lome. FIDE President answered the journalists’ questions. Apparently the level was higher than expected. Group shot at the orphanage. On February 18th Kirsan Ilyumzhinov met with the President of Togo NOC, Mr. Yawovi Yao Goe-Ho Dogbo, and the Minister of Sports and Recreation, Mrs. Angele Amouzou-Djake. He informed the Minister on the meetings with the leadership of chess federation of Togo, possibility to allocate four stipends for those who wish to study at the Russian State Academy of Physical Culture, and the experience on implementing the CIS programme in different countries. President Ilyumzhinov highly evaluated the activity of Cameroonian Chess Federation which was established a few years ago but actively promote chess, the merit goes to its President Mr. Michel Nguele Viang. In the presence of Russia’s Ambassador to Cameroon Mr. Nikolai Ratsiborinskiy it was announced that three stipends can be allocated for the Cameroonians to have chances to study at the Russian State Academy of Physical Training. 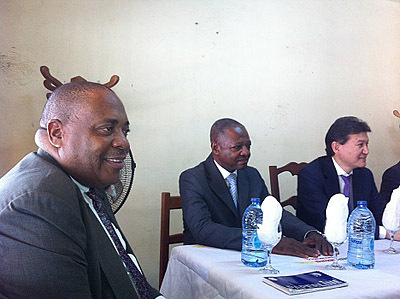 Meeting at Yaoundé Chess Club… Ncube, Viang, Ilyumzhinov. During a visit to the Yaoundé Chess Club there was the interesting suggestion to produce chess sets stemming from Cameroon’s expansive logging industry. Of course the main topic was the Chess-in-Schools program. Ilyumzhinov met with the Ministry of Education to explain the merits of chess inclusion. 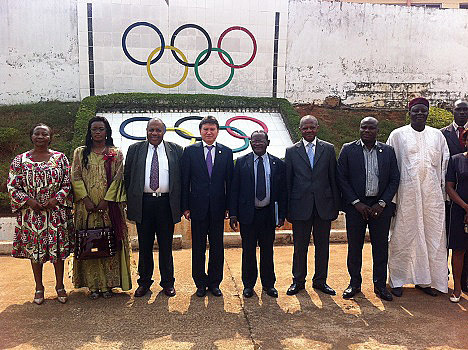 There was also a meeting with Cameroon’s National Olympic Committee. During the trip the FIDE President would meet with Presidents of Mali, Gabon and the Central Africa Republic, the latter gripped in a raging civil war.